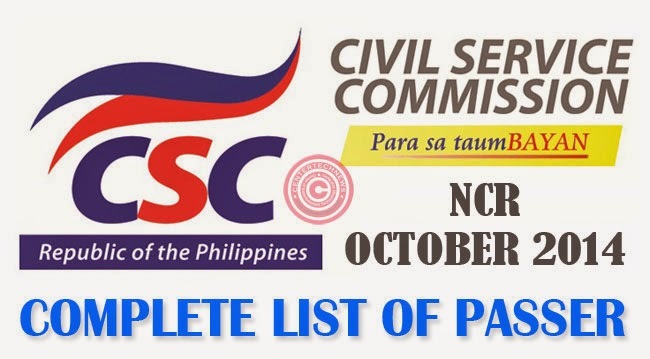 NCR Civil Service Exam- Paper and Pencil Test also known as Career Service Examination October 26, 2014 result had finally been released by Civil Service Commission(CSC) on December 9, 2014. National Capital Region registered the second largest number of test takers of Civil Service Exam- Paper and Pencil Test at 18,074 for Professional and SubProfessional levels. Civil Service Exam- Paper and Pencil Test also known as Career Service Examination had been much anticipated as the test can validate an individual’s capability to be in the government service for Professional and SubProfessional Levels. The test taker must be able to have a total of 80 percent to be able to pass. Passers must personally claim their Certificate of Eligibility with proper documents in their respective CSC Regional Office while those who failed but still want a copy of their test result can can it from the CSC official website.